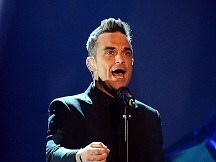 The singer said he picked up swear words from spending his early years living in a pub. And he said he upset his best friend Jonathan Wilkes by teaching his son a rude word while he was babysitting. Robbie came under fire last week for peppering his stage banter during Take That shows with colourful language, which some fans thought was unsuitable for families. And in an entry on his blog, the singer questioned whether people were more concerned about their children using rude words, or whether they were actually motivated by what other people thought of them. "Do you think mothers/fathers are more bothered about what other parents will think, than their kid actually swearing?" he asked. "I was born and raised (for the first three years of my life) in a pub. One of my first words was f*** - and one of my first sentences was 'give me a f***ing Harvey Wallbanger, please'. He added: "FYI, I didn't get one." Robbie said he ran into trouble when he encouraged Jonathan's son to use a swear word during a game. And he said he wonders how his own wife Ayda would react if he teaches any children they have to curse.